End of the weekend windswept group shot! Given the Lake District’s well known association with rain and flooding, perhaps we were somewhat foolish to arrange an outdoor event in Braithwaite in mid October. Still, on a dull, overcast autumn Thursday morning we found ourselves travelling north, our van loaded with axes, wood and camping gear headed for the Millican HQin the Lake District National Park to teach a two day workshop at the foot of Skiddaw as part of their inaugural Travel Collective event. The Lakes certainly lived up to its watery reputation and no sooner had we unloaded our gear, a band of heavy slow moving showers had us confined to our van (with a quick pub break) for the evening. The forecast for the weekend was gradually worsening; a low pressure that was originally due to batter the south coast had now been named 'Storm Brian' and it looked like he intended to join us in the north. Still, we were undeterred; our friends at Millican had arranged a giant Tentipi for us to teach in, which when enlivened with a roaring fire at its heart would provide us with a warm and cheery basecamp for the weekend. We also had access to a small bar and cafe located just next to the Millican HQ at Braithwaite Farm where we could eat and seek shelter in the mornings and evenings. After much preparation, sharpening tools, chainsawing and hauling logs we were all set by the following evening. One by one our guests began to arrive, each of them remarking upon the dire weather forecast, yet each equipped with the right gear and a positive attitude; as tents were pitched in the already soggy field, the fire was lit in the Tipi and beers were passed around and it was soon clear that the collective good will of our group was going to be a force that even Storm Brian would struggle to defeat. Saturday morning began with a hearty breakfast cooked by the Millican team and a quick introduction from their Creative Director, Jeff, then we headed into the snug Tipi to begin a full day of woodcarving. 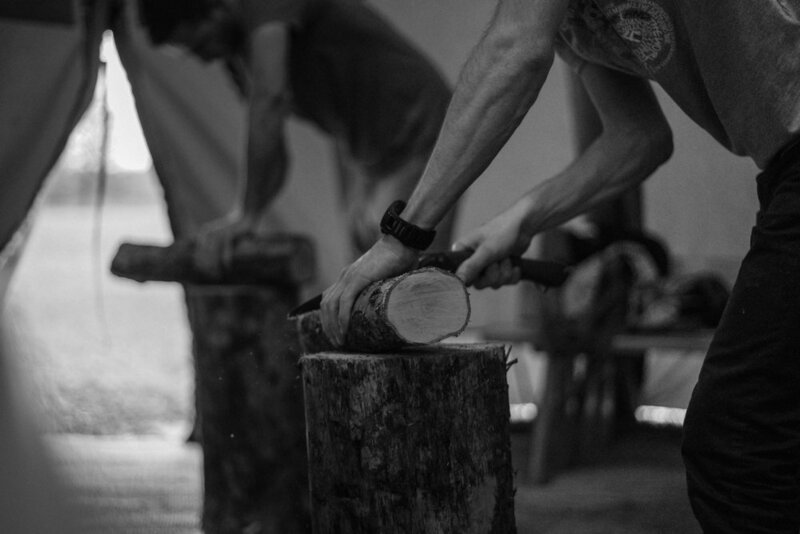 We teach woodcarving primarily as an outdoor skill; a way to learn how to use the essential tools for travelling in wild places: the axe, knife and saw. The ability to create a few functional objects from natural materials when out on the trail is not only extremely useful, it is also a wonderful way to connect with the landscape and nature in a very direct way. 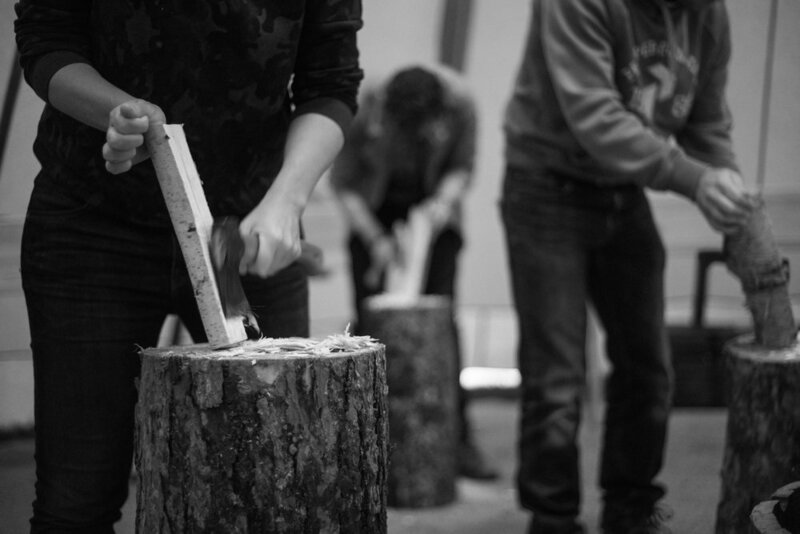 Alongside carving techniques, we also demonstrate ways in which the same actions can be applied to general outdoor duties and camping chores and we try always to share our knowledge of trees, plants and wild things to encourage a more meaningful relationship with nature. With tired muscles, sore hands and the light outside fading, we were all ready and thankful for the spread of food that awaited us that evening. Bellies full and feeling refreshed, the Tipi now became the setting for a night of travel inspired talks, sharing ideas around the campfire and unwinding after a long day of learning. Millican founder Jorrit, Rachel from Another Escape Magazine and ourselves each spoke on how travel has influenced our lives and shared ways in which conscious travel can have positive yet often unexpected results. It was at this point that Storm Brian decided to make his presence felt; perhaps something we had said had annoyed him. The Tipi shook and doors flapped as the wind howled outside, the rain poured through the vent in the roof onto the projector and we had to speak louder and louder to be heard. Although the talks were wonderfully engaging, I think each of us was secretly wondering how we were going to sleep that night and with every gust there was collective glance up and around to see if the Tipi showed any signs of imminent collapse. The night that followed was truly wet and wild. We were fortunate to have our van to shelter in but with it swaying from side to side buffeted by the wind and rain clattering onto the metal roof, sleep never really came. We worried about the tents in the night; what scenes of chaos would we discover in the morning? We were up early, crawling out of our van and into the warmth of the cafe where much needed hot coffee awaited us. One by one, bedraggled figures emerged from tents and stumbled in through the cafe door, like leaves blown in on the wind. “Did you sleep?” was the obvious question. “No”. Was the obvious response. Everyone had had a rough night; at least one tent was broken and another had water flowing underneath it. Soon though, after breakfast and hot drinks had been consumed and tales of the stormy night had been exchanged, spirits began to lift again, the weather had become part of the story and part of the adventure. It had brought everyone together in a way that a sunny summer weekend never could. Cheers Brian! We always like to give the woodcarving skills some context and illustrate how they can be a great vehicle to learning more about nature and the environment. That morning we ventured up into Whinlatter Forest to take a hike through the woods where we were able to share some of the things we’ve learned on our journey about trees, plants and the connections that form in woodlands, including the ever tumultuous relationship between humankind and nature. Whinlatter is an interesting spot; many of the former forestry conifer plantations of western hemlock and spruce are being removed and replanted with native deciduous species and we greatly enjoyed discussing the complex paradoxes that arise when thinking about which parts of the forest are ‘natural’ and which are man made. Rejuvenated and reinvigorated by the hike, the effects of a storm disturbed sleep had faded. Everyone was keen to get back into the Tipi and work further on the wooden spoons they had created the day before. As we wound down and finished up, it was a shame to have to take the tools away from everyone, so engrossed and focused had they become on making something they were proud of. Still, tools were packed away and the workshop came to a close. We left the Tipi for the last time and assembled for group photos, soaking wet tents came down and bags were packed. Slowly, after a final word from Millican, goodbyes were said and our merry group disbanded, many with long journeys ahead of them. We’re always a little sad to see people go after our workshops and this one was no exception, we feel very fortunate to have such great folks attend our events and count all our students as part of the Misc. Adventures team. Working with Millican is always such a joy for us; their ideals and ethos match perfectly with what we try to teach through our workshops and we’re happy to count them not only as partners but as friends. We want to say a massive thank you to Jeff, Jorrit, Steph and Bex for their supreme hospitality, organisation and for inviting us to be part of something special. Huge thanks also to all our guests for not only attending, but for their high spirits and positive attitudes even when the weather tried its hardest to disrupt the weekend. Extra thanks to Selfa, Rogier and Esther for coming all the way from Holland and thanks to Simon Bray for taking photos throughout the event. Hope to see everyone again soon!